Lake Havasu City is a youngster by most standards. It has only been incorporated since 1978, but it actually got its start in the 1960s when inventor and entrepreneur Robert P. McCulloch, Sr. bought up large parcels of Lake Havasu City real Estate to create a planned community. 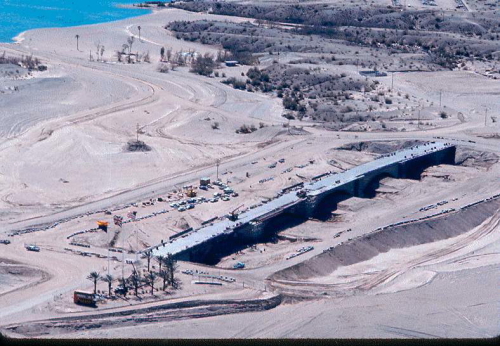 In 1963 McCulloch, who produced outboard motors, small engines and chainsaws, was flying over the desert looking for a new testing site for his motors. 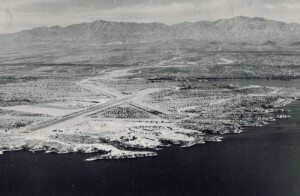 He discovered Pittsburg Point, the southwestern tip of what is now the Island which was being used as an emergency airstrip by the U.S. Army Air Corps and saw it as the perfect site to set up operations. The area was in Mohave County, which had a lot of land up for sale, so McCulloch acquired 13,000-plus acres of land at auction. 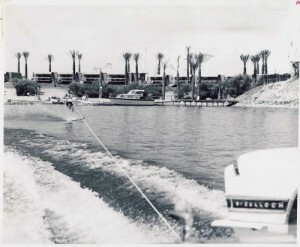 The acreage was adjacent to Lake Havasu, so McCulloch and his master planner, C.V. Wood, (who had Disneyland and Six Flags to his credit), began planning a community that could be turned into a recreational destination. Together they carved out Lots out of the raw desert land and began marketing them in a Fly Before You Buy radio program across the United States. They flew in prospective buyers free of charge on McCulloch Airlines all they had to show is $500 cash in their pockets. They were put up in the only hotel in town (which is no longer there), they were shuttled around to the semi-graded dirt lots (some were paved), and particular attention was paid to the business owners who had restaurants and retail stores. 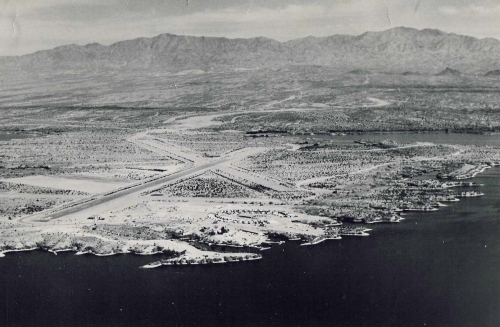 The first pioneers of Lake Havasu City arrived that way the first business owners, the first retirees, the first families with children who needed to go to school. There were still burros roaming through the middle of town and coyotes making their way to the waters edge to drink. Thirty five years hasnt made that much difference for the wildlife. 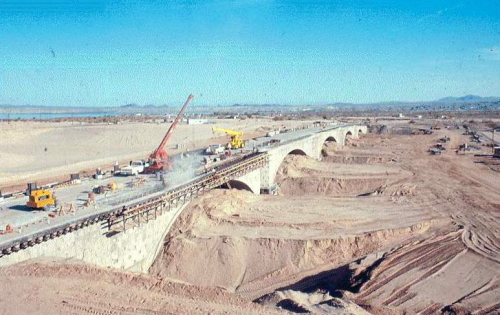 There is still only one way in and out of town to reach Lake Havasu City and that is via Hwy. 95. Main access is off of Interstate 40 to the north or Interstate 10 to the South. Burros, coyotes, big horn sheep, rattle snakes, scorpions, even tarantulas are a part of desert life that surround Lake Havasu City all of them accept for the big horn sheep have been seen within the city limits. Today, Lake Havasu City has close to 55,000 people and the population swells another 15,000 to 20,000 during the winter months when snowbirds arrive (November through March). Although it is considered a rural community, the city has reached the designation of being a metropolitan statistical area and has a fully supportive infrastructure for all required services government, police, fire, hospital, education, social services, court system, etc. There is also a diverse business base of light manufacturing, information, service, communication and recreational companies that serve the population and offer employment. There is a municipal airport, several golf courses, convention facilities and a thriving construction market.